Cleaning your windows consumes a too much time and exhausts you? You can make a change now – simply get in touch with our representatives and order our window cleaning in Forest Hill. We will deal with this nuisance for you and the outcome will be appropriate for each part of your windows – the glass, frames and ledges. With our assistance, you will have the freedom to do whatever you desire with the time you usually spend for window cleaning. But our services will give you even more, as you can notice from our list of benefits. We also provide our professional services in nearby areas: Catford, East Dulwich, Hither Green, Lewisham, Sydenham Hill. We are glad to use the best techniques to ensure that you get the finest window cleaning. The glass surfaces of your building will look spotless after we use water-fed extension pole cleaning system and jet washing on them. We use our vehicles to supply the poles with water and we can reach up to the fourth floor. In case you need polishing of windows on taller buildings than that, we have rope access team available. Call us on 020 3746 3113 and get in touch with us – these efficient techniques will bring you results right away. With our experience and craftsmanship, the good look of your property will be achieved quickly – the experts of commercial window cleaning will manage with this matter. We utilise water-fed extension pole system for quick and effective window cleaning, up to the fourth floor. For high-rise office buildings, we use the latest rope access techniques. With this equipment, we can reach the highest glass panes, even on the skyscraper-sized buildings London is so famous about. From small shops to towering business scrapers, we ensure top-notch services – take advantage, now! You can rely on the skills and experience of the professionals for cleaning all kinds of windows. The glass surfaces in our expertise are: single or double windows, bay ones and sash windows. Of course, if you have French doors, garden windows, conservatory or roof windows, we will make them nicely-looking, too. With our progressive ways of working and latest equipment, we can tackle all kinds of window cleaning, even with difficult to reach glass panes. 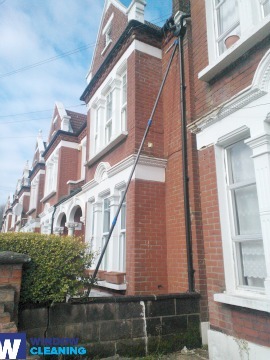 The specialists of window cleaning in Forest Hill will make you feel proud of your house. We provide the finest window cleaning services in Forest Hill. Our practice includes water fed extension pole system and also high-pressure cleaning. We guard your health and safety with non-toxic cleaning solutions and purified water. Become part of our satisfied purchasers – dial 020 3746 3113 and speak with our customer service staff. You can also book our services on-site – just fill in our special form or use our chat facility. The nearest tube station serving SE23 Forest Hill is Lewisham.